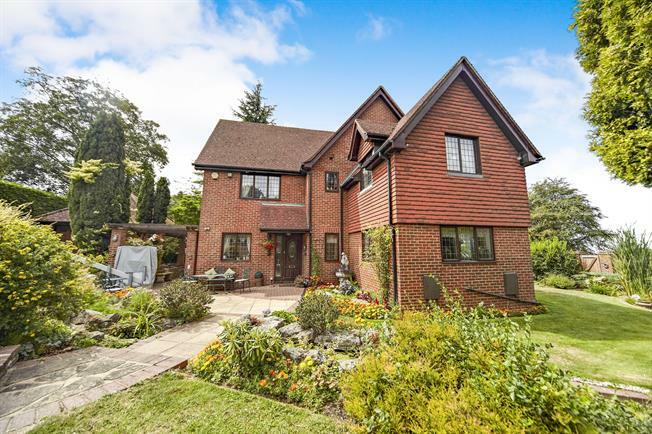 4 Bedroom Detached House For Sale in Purley for Offers Over £825,000. Bairstow Eves Purley are delighted to offer this immaculately presented four double bedroom detached family home located at the end of a highly sought desirable residential cul-de-sac in West Purley. Accessed via secure electronic gates and surrounded by beautiful landscaped gardens whilst offering views over open land to the rear this is a wonderfully tranquil and private home yet offers easy access to a range of well regarded local schools as well as local transport links. Internally the property has been well maintained by the current owners who have owned the property since new. The accommodation comprises of large entrance hall, fitted kitchen with separate utility room, downstairs study, large double aspect living room which leads through to the triple aspect dining room and downstairs shower room. Head up to the first floor and you are greeted by four generous double bedrooms. The double aspect master bedrooms is a magnificent size and boasts some lovely views as well as a range of built in wardrobes and a full en-suite bathroom with bath and separate shower. Bedrooms two and three are also both double aspect rooms which allow plenty of natural light.